Kindergarten is an exciting time in children's lives as they embark on the next step of personal and academic growth. Our Kindergarten teachers meet children where they are, and provide an individualized experience to maximize each child’s abilities. With two full-time teachers and no more than 18 students in each classroom, CESJDS Kindergarten is a warm and safe space to learn and grow. In Kindergarten, and throughout the School, social-emotional teaching and learning is infused with Jewish values/Middot. Combined with the Responsive Classroom approach, these techniques are designed to build a nurturing classroom community. Jewish values are an ongoing, integrated element of the CESJDS curriculum. They are central to our identity and purpose as an educational institution. Middot include values like gratitude, respect, and community. Students learn about one value each month, discuss it during morning meeting, and celebrate any students who acted in a way that demonstrates understanding of the value. Through daily practice, students learn to care for one another, act as upstanders, respond to issues through a moral lens, and grow to be people of integrity. 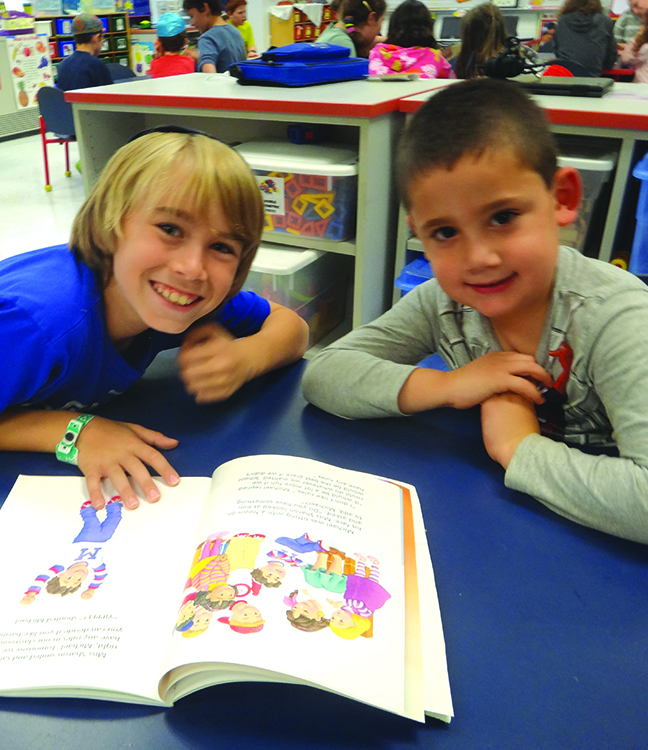 Supporting all facets of a child's growth is at the forefront of CESJDS' Kindergarten. Developing a love and confidence in reading and writing is an important part of a kindergartner’s work at school. Our classrooms are language-rich environments brimming with stories. At CESJDS, we spend time everyday engaging in reading and writing activities individually, and in small and large groups. We understand that becoming proficient readers and writers takes time and that each child develops at their own pace. We, therefore, have a variety of activities to engage all learners in the reading and writing processes. Our curriculum is guided by Fountas and Pinnell resources. Teachers design thematic units for daily Hebrew language lessons using the Proficiency Approach for second language acquisition. Using manipulatives, props, and authentic Israeli literature materials, students develop strong comprehension and basic conversational skills, thus building the foundation for Hebrew language experience and learning as they advance through the grade levels. Early language acquisition in Hebrew not only enhances overall cognitive development, but opens doors to cross cultural understanding, and global connectivity. Our youngest students experience an entirely problem-based math program, where rich, authentic contexts provide a meaningful backdrop for students to begin to mathematize their world. Through stories, puzzles, and games, students begin to use mathematical models as thinking tools, develop problem solving strategies, and read and write mathematical arguments. The program fosters reasoning, critical thinking, and communication skills, and ensures the development of a positive growth mindset. The STEM components of the Kindergarten program seek to nurture curiosity and build the identity of being a problem solver. Through a specialized science class taught by an early childhood science teacher, combined with integrated in-class components of Tinker Boxes and center activities designed by our resident STEM expert, students engage with challenges in innovative, developmentally appropriate, and creative ways using building, modeling, experimentation, engineering, design, and evidence-based decision making. Going to a Jewish day school includes much more than learning about Jewish identity; it means experiencing Jewish life together. Students connect to community in the School and around the world through our shared calendar, holiday celebrations, lifecycle events, and traditions. T’filah/Prayer, Parashat Hashavu-a/Weekly Torah Portion, Shabbat & Haggim/Jewish Festivals, and Middot/Jewish Values are the building blocks of the Judaic Studies curriculum. Through experiential learning, students develop strong ties to their Jewish identities and age-appropriate familiarity with Jewish celebrations and the narrative of the Torah. Students will often be heard singing and dancing as they acquire their T’filah literacy, develop a love for Israel, and engage in social-emotional learning through the lens of Jewish values. The CESJDS curriculum is innovative, creative, and flexible so expert CESJDS faculty members can challenge each learner appropriately. Students learn best when skills and ideas are applied across multiple disciplines. For this reason, projects throughout the Lower School are interdisciplinary. The CESJDS school day starts at 8:15 am and concludes at 3:30 pm. Each day is balanced with large group, small group, and individual learning; indoor and outdoor time; active and reflective time; and student-directed and teacher-directed lessons. The CESJDS schedule is a 6-day rotation. Kindergarten students participate in Music, Science/STEM and PE twice a rotation, and Art and Library once a rotation with faculty who are experts in their respective fields. CESJDS partners with the Bender JCC to provide afterschool programming until 6:00 pm. Walkover service is provided by the JCC at the conclusion of the school day, and students continuing home from the Lower School are escorted by a 5th grade patrol to carpool or the bus.